The World Handball Championships in Calgary, Alberta, Canada, turned to the four wall divisions yesterday, and will continue until the 21st. WPH film crews will be right there capturing the action from the show court at the University of Calgary. WPH #TeamR48 Members can watch for FREE (membership levels here: www.wphpass.com) as the stream will be at www.race4eight.com beginning at 8am Pacific today. Monday’s men’s open bracket was whittled down from 32 to 16; Paul Brady, Luis Moreno, Sean Lenning, Emmett Peixoto, Robert McCarthy, Charles Shanks, Dairmaid Nash, Martin Mulkerrins, Killian Carroll, Jon Iglesias, Mike Finnegan, Joe McCann and Colin Crehan all advanced in two straight games, creating a few interesting match ups on Tuesday’s Rd of 16. In the Women’s singles, just a couple prelim matches took place, to include wins by Shirley Chen and Suzanne Koehler. 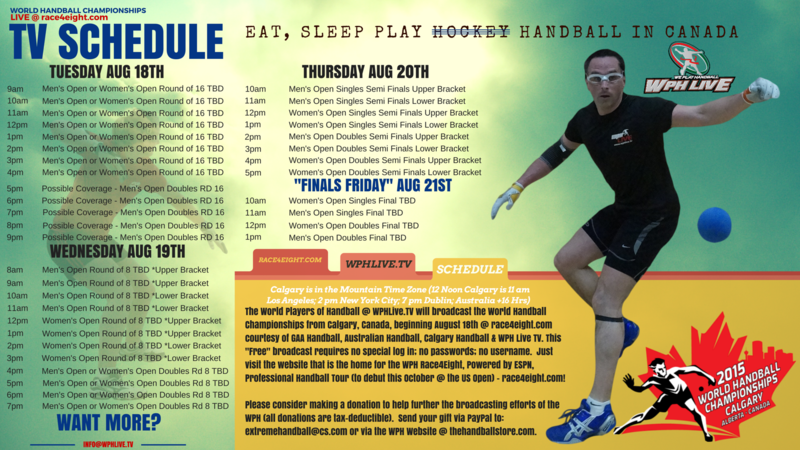 Please share the above broadcast schedule with your handball lists, club and associations. Purchase your WPH All Access Pass Membership here: www.wphpass.com, then watch the LIVE Broadcast: www.race4eight.com. WPH Membership comes w/a Race4Eight Pro Team Shirt, access to over 1,500 HD Videos, 10%-15% off all Web Store items (www.thehandballstore.com) and two free Dave Chapman Instructional Video links, o name just a few. In Monday’s 60+ Men’s Singles, John Rossiter and Peter Larkin advance to the Rd of Eight; meanwhile, Larry Lenning, Jay Spooner, Dennis Stoner, Finton Farrelly, Mike Holander, and Neville Farrelly all get past their counterparts and will play on Wednesday after a much needed day of rest on Tuesday. In the 65’s, Dan Scilley, Merv Deckert, Ed Campbell, Ivan Elliot, Rich Gooseman, Eugene Kennedy, Ned Buggy and Greg Raya all advanced to the quarterfinals and will play their next match on Thursday. A super-packed 70+ singles bracket features the very best in the game, as amazing round of 16 match-ups will occur throughout the day (Tuesday). Junior divisions, singles and doubles, boys and girls, have begun in Calgary; meanwhile, age division play, skill level play, pros and amateurs all step n the court beginning this morning n Canada.